Last Friday was an exciting day for planetary astrophysics, as the Dawn spacecraft entered into orbit around the asteroid Vesta. It’s the first probe to enter orbit around an asteroid in the main asteroid belt! You can check out the story on the Bad Astronomy blog or NASA’s news release. While much of our knowledge of planet formation comes from remote observations of protoplanetary disks where planets are currently in the process of being formed, we can also learn about it by looked at the relics of planet formation in our own solar system. Vesta is a particularly interesting object for learning about the early solar system. It is the second biggest asteroid in the asteroid belt (after Ceres) and is believed to be the sole surviving intact member of a class of objects called planetary embryos. The rest of these embryos either assembled into the planets in the solar system today or were broken apart into smaller asteroids and dust by collisions. By studying Vesta, we can learn about how protoplanets formed and evolved. This review paper discusses the current understanding of Vesta’s formation and structure; it then touches upon the exciting discoveries that the Dawn mission is expected to make as it maps out the surface features, gravity, and composition of Vesta in detail. I will begin by summarizing the current methods of remotely determining Vesta’s properties and then briefly discuss the Dawn mission. Vesta’s mass is measured by observing how it interacts with other nearby bodies. 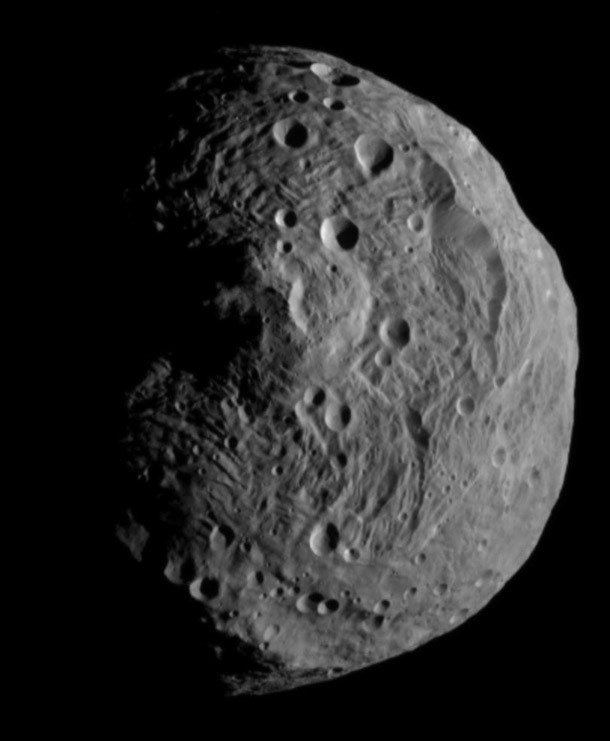 These include measurements of how Vesta’s orbit is perturbed by nearby asteroids, how Mars’ orbit is perturbed by Vesta, and how other asteroids are perturbed by Vesta. These observations are used to determine the mass within about 2%. Because we’re interested in measuring the bulk density of Vesta (and thus constrain its composition) we also need to measure the shape, which is much more challenging to observe from Earth. The best model of the shape was made by observing Vesta using the Hubble Space Telescope (an example of an HST observation is shown in Figure 1). The volume can be determined in this way to an accuracy of 12%. The bulk density of about 3760 kg/m3 is consistent with a differentiated body with a core and a mantle layer. 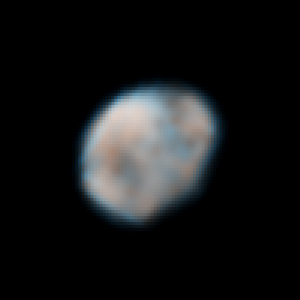 Image of Vesta taken using the Hubble Space Telescope's Wide Field Planetary Camera 2 in May 2007. A combination of HST imaging from space and Keck imaging from the ground shows that the east and west hemispheres of Vesta look distinctive; the eastern hemisphere is brighter and cratered (like the highlands on the Moon) and the western hemisphere is darker (like the mare basalts on the Moon). The images are not high resolution enough to see volcanic or tectonic structures. The HST images of Vesta also indicate that there is a massive south pole basin on Vesta; this basin is likely to be the result of a large impact which scattered chunks of Vesta far afield. Planetary scientists can determine the parent body of a meteorite by comparing the composition of the meteorite to the surface spectra of larger bodies in the solar system. A sizable class of meteorites match Vesta’s spectrum; these are expected to have been created by the large impact that created the southern basin. The meteorites have been studied in a lab to determine the surface composition of Vesta, which appears to be made of a mix of basaltic rocks and plutonic rocks. By comparing the density of the Vesta meteorites, made predominantly of silicate mantle material, to the bulk density of the asteroid, a core mass can be determined. Estimates of Vesta’s core mass vary significantly, and range from 4-50% depending on the models used for the asteroid interior. NASA’s Dawn spacecraft is equipped with instruments that will revolutionize our understanding of this important early solar system relic. Because Dawn is now in orbit around Vesta, we will measure the gravity field and topography in much greater detail. From these measurements, the interior structure of Vesta can be determined, including the composition and sizes of each of the internal layers. We will be able to determine the the size of the core and constrain the timescale of differentiation. This image was the first image of Vesta to be taken by NASA's Dawn spacecraft after it successfully entered orbit around the asteroid on July 15th 2011. The first image of Vesta taken by Dawn (shown in Figure 2) illustrates the increased level of detail with which we’ll be able to measure the surface features of Vesta and understand the geologic events that created those features. We expect to learn about the giant impact that sent meteorites from Vesta flying towards the Earth and created a massive basin on the southern pole. We hope to learn the reason for the differences between the eastern and western hemispheres and determine whether the asteroid was previously volcanic. Detailed observations of Vesta will give astronomers a new chapter in our history book about the early solar system. We hope to answer questions about the formation of planetary embryos in general and learn why Vesta is the only remaining member of this class of objects. Diaries of a Dwarf Planet: What are Those Spots on Ceres? What’s Next For Kepler? The Age of Solar System Exploration Stuff Between the Stars: Gas, Dust, and… Asteroids?